Life is full of obstacles and hard decisions. These obstacles can put an enormous amount of pressure on us. What are you supposed to do when you are confronted with an obstacle in your life? A giant that seems impossible to overcome, and the only reaction you can seem to muster up is one of fear? We do face these types of situations in our lives. Giants are real, and they are usually bigger than we expected them to be. If you have never been face to face with a giant in your life, be prepared, it will happen at some point. The best decision you can make today is to decide what your reaction will be when that giant stands before you. The worst decision you can make today is to believe you can wait until you stand face to face with the giant before you decide how to react to it. There are many examples from Scripture about a giant entering into peoples lives, seeking to destroy who they are and what they believe in. Some of these examples ended in despair, and some ended in victory. Perhaps the most well known example of this is the story of David and Goliath (1 Samuel 17). David entered into a situation that seemed impossible. Everyone around him was controlled by fear and uncertainty, and David spoke truth and confidence into the situation. Many people think that David walked into the situation and decided on a whim to confront the problem. In reality, David had already faced giants like this, and he had been preparing himself for it. When in battle, soldiers will dig out deep ditches on the battlefield, commonly referred to as a foxhole. These spaces can provide shelter from oncoming enemy fire, and even allow a surprise attack if they are hidden in them well enough. They can be used as a great means of support and preparation in the battle, but they can also become a place where fear takes over, and if the soldier is not careful, he may grow complacent by the safety of the foxhole. David spent time in a foxhole as well. 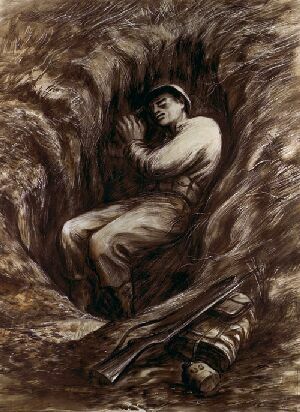 His foxhole wasn’t a physical ditch, dug into the earth. It was a spiritual place of rest and protection surrounded by the presence of God, and it prepared David for upcoming battles in his life. David was able to push past fear in his life and defeat giants, and there are disciplines that he had in his life that allowed him to act on his faith and convictions. When you read about David’s life in Scripture you must read the Psalms that are recorded by him. If you skip over them, you will miss who David really was. In Psalm 63 David longed for the presence of God in his life. His one goal, his ultimate desire, was to be near to God. There is an unmistakable connection between David’s desire to be near God and his confidence in God when giants came knocking on the door of his life. In Psalm 27:4 David said, “One thing I have desired of the Lord, That will I seek: That I may dwell in the house of the Lord all the days of my life. There is also an unmistakable connection between a lack of God’s presence and spiritual complacency in the life of a believer. God pursues His people, and we should pursue God’s presence. If we want to face the giants in our lives with courage and confidence, we must be practicing the pursuit of God’s presence like David did. When David questioned why others were not willing to confront the giant in 1 Samuel 17, it is clear that David was surprised by their lack of faith. For David, this giant was the same as other giants he had faced before. He reminded himself, and the others, that in the past God had delivered him from other giants. David realized that God is faithful and he found it logical to assume that God would act on his behalf, because he had seen Him do it before. David recalled the battles he had fought, and won, through the course of his life. The truth we must understand is this; reflecting on who God is and what He has done gives confidence and courage to face giants in our lives. If you want to gain confidence in God, look back and see what He has already done. Faithfulness is God’s trademark. David was more concerned with making God look good in front of his enemies than he was making himself look good in front of his friends. For David, one thing mattered; that the world would know that the God of Israel is the one true God. When God established his covenant with Abraham (see Genesis 17), his desire was that the world would see the one true God through His relationship with the people of Israel. This was David’s goal as well. It is hard to go wrong in life when our purpose is to see God glorified. When a giant comes into our lives and questions whether or not our God is big enough handle what we are facing, we must move forward for the glory of God. While staying in the foxhole may seem safer sometimes, it does not reflect who our God is. Foxhole living is not an option for the believer, because in that hole we may sink into apathy. It may feel safer in there, but it will never deliver a victory.